Maidha palu sweet puris can be made as prasadam for pujas.Children love them for the sweet taste. Mix maidha along with a pinch of salt and water as we mix for puris.Make small round puris and deep fry them as puris.Meanwhile pour milk in a wide bottomed basin.Dip the deep fried puri( 2 sides of the puri) in the milk and immediately take off it and place in another plate.Now sprinkle powdered sugar,and let it dry.. 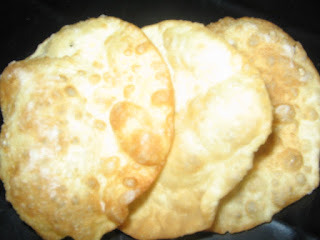 I love puris..sweet puri sounds great..my little one will love it!! Love these sweet pooris. Slurpp. Wowwwwwwwwwwwww... Andhra traditional recipe.. chala bagundi kanthi garu.. yum yum yummm !! What a wonder and simple sweet dish.